Another year has passed since I got promoted with a ridiculously huge (>20%) increment which I blogged about here - Salary - You Are Your Best Investment. I was given my new compensation package last week and it was still pretty decent (exceeded our expectation of 5% yearly). Monthly/Annual salary increases by 8.6% while the bonus remains the same in terms of the amount but decreases when converted to the typical measure of x number of months (1.4 months vs 1.71 months). Sounds like some mathematical problem sum? lol. - CPF RSTU - Is It Worth It? The frustrating part is when there are other "senior" people in the team who are doing exactly the same kind of work and are less effective/doing lesser when it comes to improving processes/automation/initiatives but getting a lot more pay. I guess they are already in the cruising stage! Oh well, I can imagine a few years down the road and I become part of those "senior" people and the new graduates will come in thinking KPO is earning too much for doing the same work as them. In my opinion, there will never be enough money and there will always be others that are poorer/richer than you. On the other hand, time is limited, we all have the same number of seconds, minutes and hours in a day. When you work, you are actually selling away your precious time to the company/employer. Why not sell it to the highest bidder? We still believe that time is limited and we definitely do not want to spend the majority of our time working. One year ago, I used to think that money is everything. If I were to look out and get a higher offer, I should just leave because that will probably accelerate our plan for early retirement/financial freedom too. However, the highest bidder may not be as attractive as I thought it would be. My current workplace is really almost perfect except for the above rant. lol. I have a spreadsheet to project our salary increment and track the actual increment. Based on our starting salary and an assumption yearly increment of 5% (I thought this is conservative but CZM thinks otherwise), it would have taken me 10 years and CZM 17 years to reach our current salary. 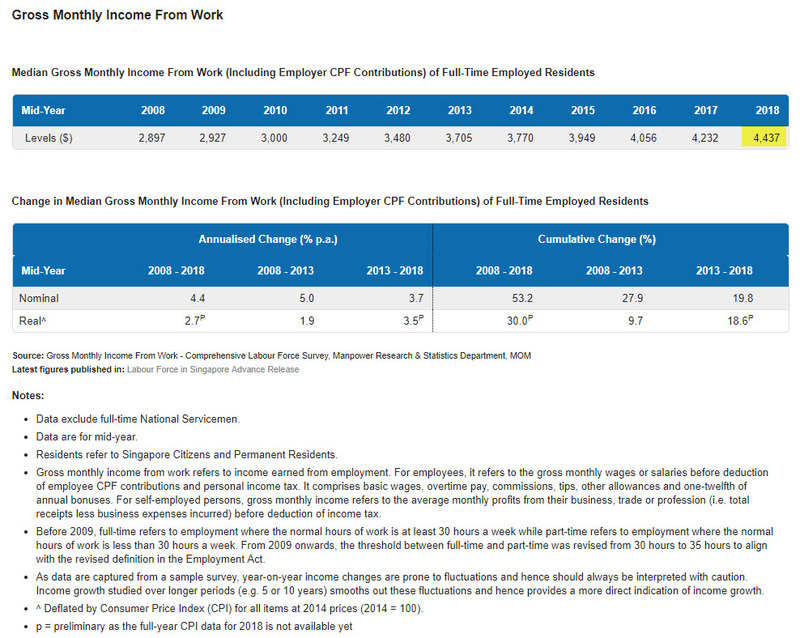 I will be using the 2016 median income ($4,056) as an example in the spreadsheet (because it was created then and I am lazy to change the numbers), excluding the employer CPF portion ($3,467) because who does that! 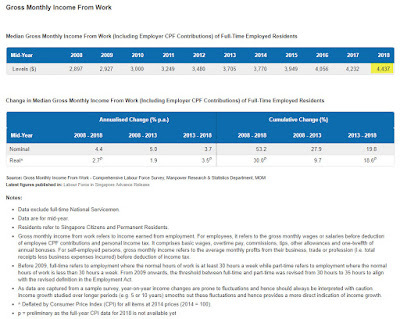 Imagine people negotiating with HR for a higher salary with X% increment based on their current salary including the previous employer CPF contribution. lol. The cells highlighted in yellow are for you to input manually, everything else is formula linked. The spreadsheet projects your yearly salary based on an assumption of 5% increment. The "Salary Projection" projects based on your first drawn annual salary while the "Revised Projection" projects based on the latest "Actual Salary" specified by you. As you can see, it would have taken this imaginary person 6 years (31-25) to reach his current salary (27-25). All the best to our readers! Hope you get a nice increment too!